Did this before Mr B went to work and enjoyed the morning sun. I even went off road in the local country park for a little of it. I really should do that more often. I forgot to do conditioning. Will do tomorrow. 5.45mi, 44:25 , 8:09/mi, 148bpm. It was really warm already by the time I went out at 6:40am. I felt like this was going to be a really nice session but the second interval made me think otherwise. Managed to claw it back a bit! It's hilarious (aka frustrating) how close my threshold level is vs my 90% level. Look at the third rep! Mini B was excited when I sat him in the running buggy so I thought I'd give it a whirl. I stopped at every road crossing and made sure I got a smile. Then he started to look a bit spaced the last time I stopped so I walked form then on, but he just fell asleep. He did wake up as soon as I had my shower though and was full of beans. So, success, I think! Another early one before Mr B went to work legs felt pretty tough and hamstrings very tight. Not sure if it was from the buggy run or conditioning or what. I *actually* stretched so it must have been bad! It was already REALLY warm as well. Did conditioning. I was *so* close to not bothering as I was out all day at a very hot sports day and was tired after bad night. But, the completist in me one out and I did the bare minimum 20. 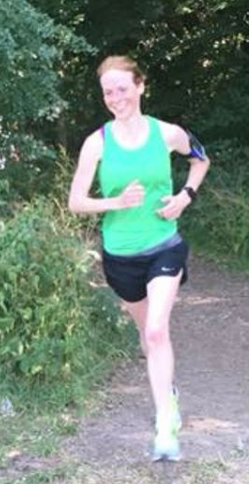 I was well up for this all week and thought maybe I could push it at park run, but I was up with MiniB since 5 and felt hungry as soon as I stepped out the door at 8 and was very hot again and just felt like I was struggling even on the pre-parkrun bit. Then I got there and someone mentioned that they had pacers. I knew the guy doing 20min pacing so I thought maybe I'd try and keep a steady distance between me and him. I went off and felt surprisingly good so I thought maybe it was ok after all but I slowed down and the breathing got hard by the 3rd lap and then I got horrible horrible stitch at the end, so much so that I nearly walked just the last 100m. It's weird - normally I only get stitch if I've eaten sweet stuff too close to running. I managed to finish 1st lady and 19th overall but only 21:03, so Mr B still holds the house-record. Jogging home was hard too. I think maybe I was dehydrated? Anyway, I still finished the morning pooped, but being glad that I'd done it. This is something that I heard Des Linden say recently - if you feel rubbish or the workout is rubbish but you finish off being happier that you did it than if you didn't, it's fine. Just keep showing up. If you finish a run thinking "i wish i hadn't done that" then maybe you are overtraining and need a rest.